Apple is slowly transforming its iPad into a 2-in-1, and while this tablet may not be a laptop replacement, it's more than simply an iPad Air 3. It's best used with pro-level accessories like the Smart Keyboard and Pencil, but it gets even more expensive. 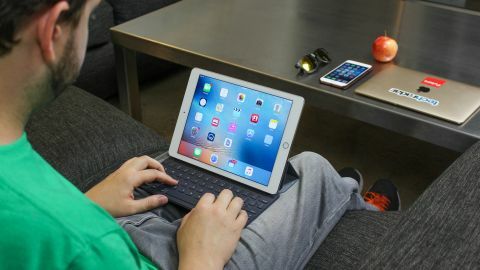 The iPad Pro was ambitiously touted as Apple's tablet that had the guts to replace your laptop, and it now comes in an ideal size that perfectly demonstrates bigger isn't always better for everyone. Update: Although Apple no longer sells the iPad Pro 9.7 and is focusing on the iPad Pro 11, there are some retailers selling this iPad from 2016 at a discount and it's worth a second look now that it's been updated to iOS 12. Even though I was thoroughly impressed with the grunt behind the powerful original iPad Pro 12.9 and new iPad Pro 12.9 (2017), I longed for that standard 9.7-inch display and form factor with the same pro-level features. It took Apple a year and a half to launch a proper iPad Air 2 successor and, in that time, it fit almost everything from the giant iPad into a smaller frame. It's way more than an 'iPad Air 3' upgrade. I can now listen to amped up music through its four loud stereo speakers, doodle away with the Apple Pencil and seamlessly attach a keyboard without fumbling with Bluetooth. Its Smart Connector port may be my favorite new feature inherited from the original 12.9-inch iPad Pro. It's not all hand-me-downs. The iPad Pro 9.7 actually strikes out on its own with a few advancements. It was the first to tout True Tone display technology that adapts to my environment by subtly adjusting the white balance, and there's a much wider color gamut behind its anti-reflective coated glass. Its camera is 12MP and shoots 4K video, taking cues from the iPhone 6S and iPhone 6S Plus cameras. While the new iPhone XS and iPad Pro 11 have better cameras, the iPad Pro 9.7 still has the snappers on most slates beat, and with the option for 256GB of storage it's got more space too. It's a tablet juggernaut - not in size, but the asking price. What we have ended up with is a tablet juggernaut - but without looking like a juggernaut. On the other hand it also has a serious asking price to match its power, and several easy-to-spot software limitations, even with the iOS 12 software now available for the tablet. The iPad Pro 9.7 price at launch was $599 (£499, AU$899), which made it the most expensive 9.7-inch iPad that Apple had ever released. That was higher than the iPad Air 2 launch price of $499, (£399, $699), and even higher than the newer iPad 9.7 price of $329 (£319, AU$469). A couple of things have happened since launch though: the price has dropped and more expensive iPads have arrived. Apple has actually stopped selling the iPad Pro 9.7, but some other stores do have it and you can get it for over $100/£100 off, though it's becoming increasingly hard to find. Try your luck at our iPad Pro deals guide though. As for the newer models - Apple is charging a starting price of $799 / £769 / AU$1,229 for the iPad Pro 11, so even at full price the iPad Pro 9.7 looks like a bargain compared to that. That's important because you'll still have to pay for the keyboard cover and Apple Pencil separately. Is there enough here for the iPad Pro 9.7 to still make our list of the best tablets? Let's explore the 9.7-inch iPad that wants to be your laptop-replacement. From across the room, I couldn't tell the difference between this iPad Pro 9.7 and my iPad Air 2 when I was charging both during my battery life tests. They're nearly identical on the outside, and that's a good thing. The 'Pro' label doesn't mean bigger, it just means bolder. The iPad Pro 9.7 has the same sub-pencil-thin dimensions of 240 x 168 x 6.1mm, making it a natural fit for two hands and easy to stow in a backpack. Surprisingly, its weight matches, too, despite the specs upgrade: 437g for Wi-Fi and 444g for Wi-Fi + Cellular again. The new "Pro" label doesn't mean bigger, it just means bolder. You get the same polished aluminum frame, fast Touch ID fingerprint scanning home button and a 9.7-inch Retina display. The lightning port hasn't moved from the bottom, the headphone jack and sleep/wake button are still on the top, and the volume rocker remains on the right side. In fact, the only surefire way to tell the difference from afar is to opt for the new finish. There are now four colors instead of three: Silver, Gold, Space Gray and the iPad 9.7-exclusive Rose Gold. This isn't the only way the tablet matches the iPhone 6S and iPhone 6S Plus, though. There's a slight camera bump on the back that no one likes, but it's a fair trade off. It makes way for a 12MP rear-facing iSight camera, just like its smartphone counterpart, and now there's a True Tone LED flash. Yes, that's right, your tablet camera is as every bit as good as your phone camera. Still, please don't awkwardly take photos with it in public. Yes, that's right. Your tablet camera is now every bit as good as your phone camera. But please don't take photos with a tablet in public. It's unseemly. Of course, upon even closer inspection, you'll see two more changes from the iPad Air 2 by way of new speakers at the top and bottom and a Smart Connector port on the left side. They're flush with the aluminum frame and almost hidden, but make no mistake, they've have acted as game changers for the iPad Pro series design. Four speakers, two at the top and two at the bottom, give the new iPad Pro 9.7 a proper stereo setup, and they're loud enough to drown out the bottom-firing, twin-speakers of the iPad Air 2 at full volume. Best of all, they're not blasting music and Netflix movie dialogue out just one side. I no longer felt the need to cup my hand around the speaker to get a decent volume for myself without bothering other people around me by cranking it up all of the way. Turning the tablet in landscape mode to watch a movie, I found everything sounded natural. Part of that balance is due to the fact that the upper top speakers always handle mid and high frequencies and they'll change depending on how you hold the iPad Pro, rotating the sound as the screen orientation does. Apple smartly refined the iPad Pro 9.7 design, and that's not the only clever way it changed up its traditional tablet look and feel in its push to the professional leagues.